After losing the election of 1912, Teddy Roosevelt set off on a speaking tour of South America, and while there was asked to participate in an expedition to chart a previously uncharted river. Accompanying him was his son Kermit, who was asked to keep an eye on his father. Partway through their journey, the pair become separated from the rest of their expedition and stumble into a village plagued by a mysterious and sinister beast. Tasked by the villagers to kill the beast, Kermit and Teddy find themselves fighting a creature that might just be the death of them. A thrilling novel that will satisfy lovers of history and adventure alike. 1914. Brazil's Rio da Dúvida, the River of Doubt. Plagued by hunger and suffering the lingering effects of malaria, Colonel Theodore Roosevelt, his son Kermit, and the other members of the now-ravaged Roosevelt-Rondon scientific expedition are traveling deeper and deeper into the jungle. When Kermit and the Colonel are kidnapped by a mysterious Amazonian tribe, they soon discover the price of their freedom. They must find and kill a ravenous beast – a beast that has never been seen and that leaves no tracks. 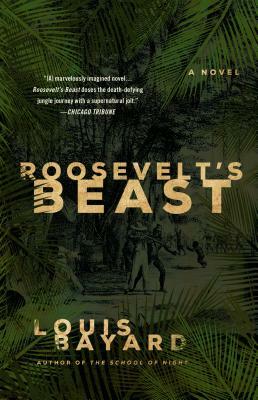 With his characteristically rich storytelling and a touch of old-fashioned horror, the bestselling and critically acclaimed Louis Bayard turns the well-known story of the Roosevelt-Rondon expedition on its head and anatomizes the demons that can haunt us from birth to death. Louis Bayard is the author of the critically acclaimed The School of Night and The Black Tower, the national bestseller The Pale Blue Eye, and Mr. Timothy, a New York Times Notable Book. He has written for Salon, The New York Times, The Washington Post, and the Los Angeles Times, among others. He lives in Washington, D.C.